Chef tells us that you "gotta have fun" and as we looked around at the tables full of faces smiling because of their company and good food, listened to the laughter and head-thumping music permeating the air, and savored the lingering tastes of delectable bites we had already devoured, we could understand how Preux & Proper embodied that mindset. 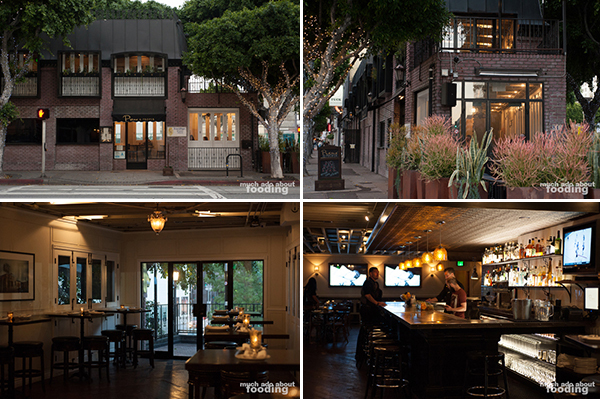 A two-story restaurant with respectively split personalities between the floors, this spot in Los Angeles crossed its one year anniversary mark a few months ago and has kept on swinging since opening. These days though, it is helmed by a separate set of culinary warriors than its initial opening group - Executive Chef Samuel Monsour, Chef de Cuisine Steven Hacker, and Sous Chef Paul Trevino who have worked together as a team before. The concept still lives on, however, where the different parts of the restaurant carry different vibes. Downstairs you'll find a neighborhood hideout that captures the essence of The Big Easy with a frozen daiquiri bar and hearty foods; upstairs features a finer dining menu, craft cocktails, and "uptown" Southern hospitality. We stopped on by one evening to see what new New Orleans must now look like with the talents of the recent kitchen changes in place. CIA-trained Chef Sammy started his foray into the culinary world young, growing up in Chapel Hill, North Carolina and working at his parents' restaurant. Moving and traveling around, especially in the South, gave him different perspectives on varying cuisines and creative dish ideas. Prior to relocating to LA, he had been in Boston and opened a few restaurants there (JM Curley and Bogie's Place). How do you decide what goes on your menu here? I like rustic, hearty food that is simply presented and tastes better than expected by sourcing really good ingredients. Everything here is from scratch and super sustainable. Our seafood works with Monterey Bay Seafood Watch; we buy from a local hog farmer. I traveled all over the South so my flavors are very southern but from all over - Carolina, Cajun/Creole, touch of Texas, Mississippi, Arkansas, Nashville, Memphis..."
At first glance, the menu was distinctly southern in style with the big boldness of New Orleans familiars but reading the ingredients proved the unique perspective that Chef Sammy brought to the table. Small touches here and there that aren't typically seen accompanying these southern classics made for an interesting read and inquiring further, we wanted to know what his own favorites to make were. If you want to take a step into the chef's mind, you'll have to try out the beef heart (takes a week to prepare! ), pâté (one of the first successful recipes in his career), Andouille sausage, and foie gras torchon. With each dish he rattled off, it became apparent that the whole process behind producing these dishes was the main reason for dubbing them favorites. We started off the evening imbibing some of their cocktails (all listed at $13) which took on a classic vibe with choices such as French 75 and ours of the Old Fashioned (made with Eagle Rare) and Sazerac (with JP Wiser). There were also several craft beers on tap and glasses of wine to choose from. 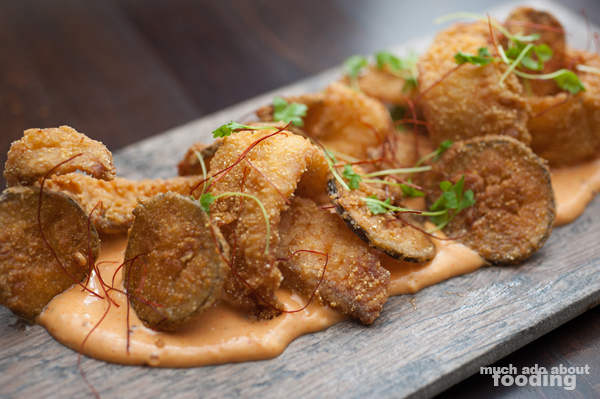 From the appetizers section of the menu, called "Nickels and Dimes," one of our first picks was a more typical southern choice - Fried Mississippi Catfish ($14 - with house pickles, celery salt, and red remoulade). I was excited to see these morsels come out in a cornmeal batter, and each resulting crunch afterward into juicy fish was proof that they sure know their southern food here. The fried pickle chips were a great touch for both authenticity and flavor, and something about the remoulade was addictive. It took what we could not to lick the board clean. It was mainly the starter and shareable plates that Chef Sammy boasted about so we were sure to turn our attention there. That was a good decision, and I recommend that diners at Preux & Proper do the same because you'll see his creativity and fun shine through. The Smoked Beef Heart Toast ($9 - lemon, shaved trinity, and Rancho Gordo heirloom Domingo Rojo beans) was served as two heaping, lengthy pieces of toast that supported beautifully soft and savory shaved beef heart. 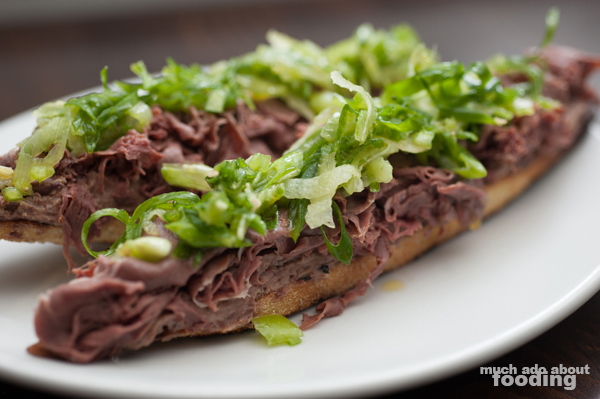 Imagine the tenderness of a beef tartare with the mature and smoky flavors of a roast beef but with a more distinct note. Greens on top gave a little pop to each bite in taste. Easy to see how this was a restaurant favorite as well. The real star of the appetizers we tried, however, was the Foie Torchon ($24 - pain perdu, smoked strawberries, Doubletree Farm sorghum, and Fruity Pebbles) but not because it contained foie gras. What would you decide to pair with Hudson Valley foie gras yourself? Would you have thought of brioche? Perhaps. Would you consider throwing in smoky, slightly macerated berries? Well, some places definitely pair up housemade berry jam and foie gras so that isn't entirely new. 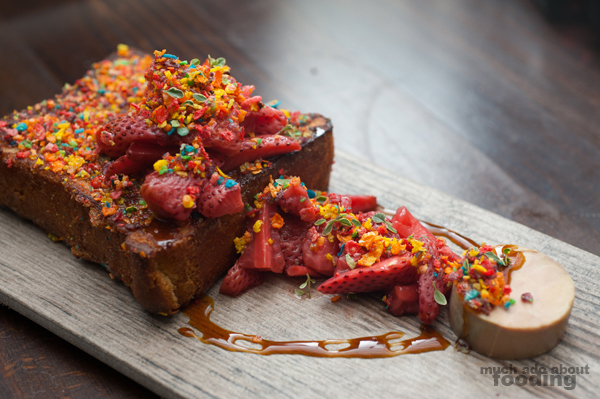 Would you be so innovative as to throw in breakfast cereal, particularly Fruity Pebbles? I think not, and that's why Chef Sammy is noteworthy here. He explains that their base is with citrus oil which certainly highlights the other notes on the plate, and we found that it worked out incredibly well together. That bright zesty crunch from the cereal bits scattered all over the berries and foie gras provided a brilliant contrast between the otherwise creamy and smooth nature of the plate. The dish was sweet, savory, zesty, and divine, not to mention colorful. If you're looking for some flair of personality, you'll find it in the torchon. 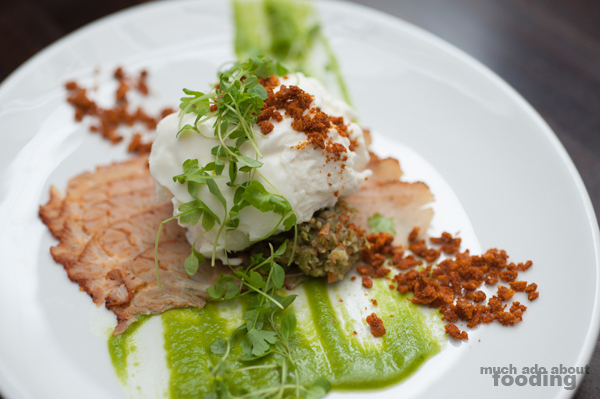 Another menu item that had great composition and juxtaposition of textures was the Burrata ($15 - house Tasso ham, muffuletta relish, and horseradish chimichurri) whose pleasant creaminess was sprinkled with pork cracklins for additional crunch. Sliced thinly, the Tasso provided a delightfully savory "wrapper" to each portion of burrata we managed to slough off from the main bundle, and the muffuletta relish gave a vinegary zing that cut through the flavors. 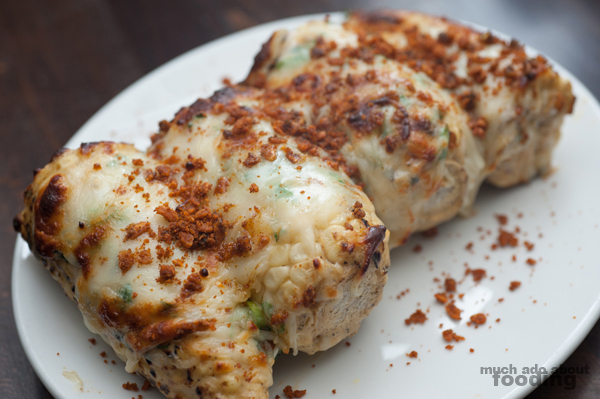 It was another restaurant favorite for apparent reasons - great balance and taste. "Developing any recipe, if you can think of something that it is like that exists, you can find a recipe to modify. You experiment. 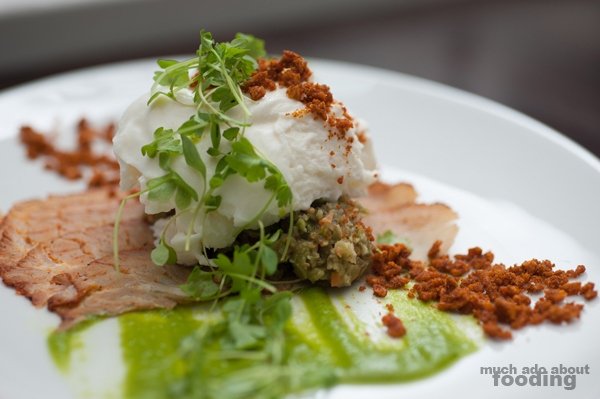 You look back and see the trigger dishes that developed your repertoire, your style, your personal cuisine. They all make sense to you then, even if they seem random to someone else. Those are your flavors." As we moved through the menu sections, we began to notice that some of the interesting ingredients in the dishes had a base in traditional junk foods. Inquiring a bit, we discovered that Chef Sammy had built up a minor reputation for that at his other restaurants as the creator of common junk foods from scratch. He went into the finer details and fascinating process of how he had made Fruity Pebbles before which we won't disclose here but know that it is certainly noteworthy. A savory version had been created to pair alongside a chilled Tom Kha Gai dish made with poached lobster, cilantro, and lemongrass; diners got a box of the multicolored 'pebbles' to top the soup with which were dyed by various pureed peppers. "When you figure it out, you have this 'I get it!' moment, and that's cool." While we didn't quite get the from-scratch version of junk food, we certainly saw some uniqueness in Preux & Proper's Derrty Skreet Corn ($11 - American Chz, Cool Ranch ranch and pork cracklins) which proved to be quite the indulgent player on the "Mighty Healthy" menu section...if you could call it healthy in any form. Our waiter could not resist telling us that the Cool Ranch ranch was basically pulverized Doritos Cool Ranch chips mixed into ranch dressing. What did all of this result in? Cheesy, creamy, guilt-inducing bite after bite into each piece of corn on the cob. Naturally, I shied away after one or two bites because of how rich all of the heavy flavors were but Duc dug right in, savoring the nostalgia of Doritos flavor and memories of street corn from the neighborhood he grew up in. 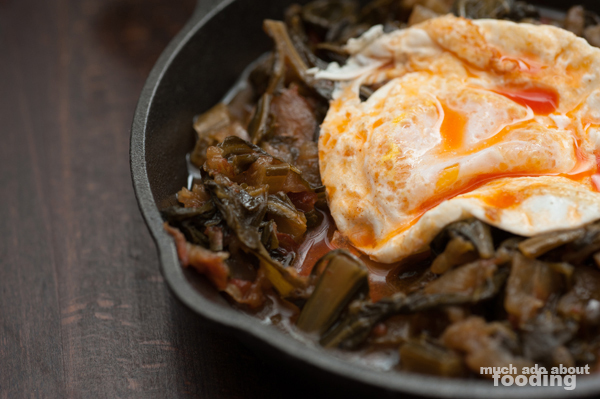 The more classic Southern choice on that vegetable-focused section was the Braised Collards ($13 - country ham, Chino Valley egg, and fresno hot sauce) which arrived in a hot skillet with a seductively wet and runny egg on top. If you're searching for a wholesome, more authentic unaltered dish from the cuisine, you should stick a fork into these tender greens. 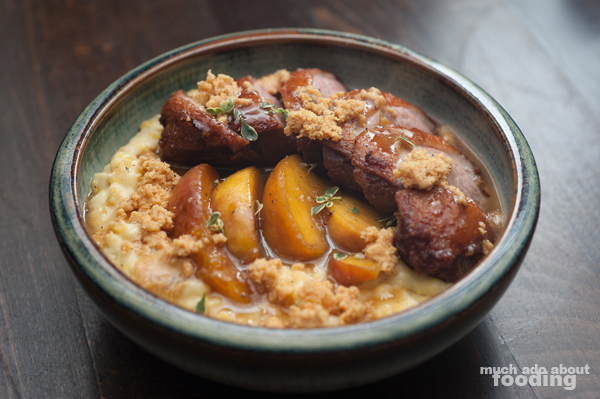 If you want something influenced by the South but still bearing the marks of pushing boundaries a little, you might want to dig into our entree choice of Cliche Duck Breast ($32 - coconut grits, roasted peaches, and bourbon sizzurp). Not only did duck breast catch my eye because I cannot resist good duck but the idea of coconut grits also piqued my interest. What exactly would that mean? In this case, the bowl that came out felt more dessert-like in nature as the coconut incorporated into the grits was accompanied by brown sugar and other sweetness. Each slice of duck was perfectly cooked and could easily stand without all of the other dish components. 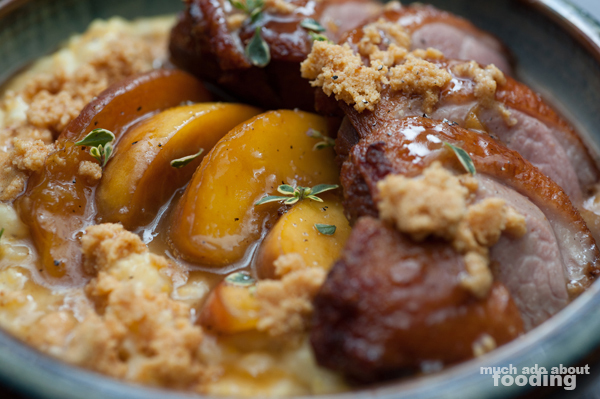 There just happened to also be deliciously roasted peaches and creamy, sweet grits to go with it all. The night ended with a beautiful slice of Kassady's Mamma's Key Lime Pie ($8 - secret pecan crust and extra fancy whipped cream), a testament to the closeness of the team at Preux & Proper. Kassady is the bartender in the downstairs portion of the restaurant, and her special family recipe had wowed the kitchen to the point that they had to throw her pie on the menu. 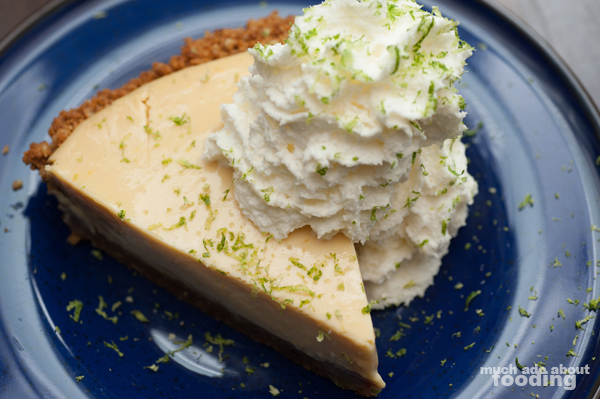 After our initial bite, we knew why - this is one tasty key lime pie! Many places oversweeten this dessert to the point where your teeth hurt but our finisher that night was just the right amount of tart and sweet. What a lovely want to end the evening. 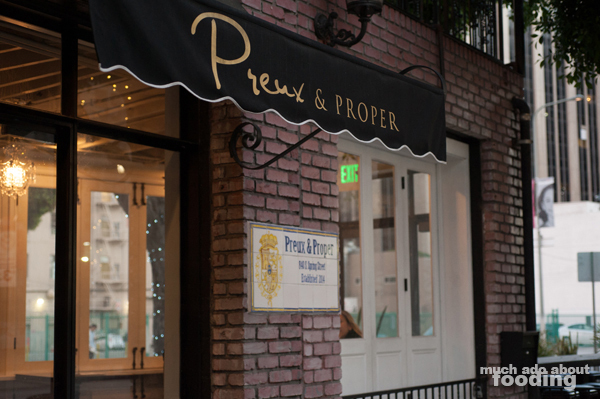 If you're looking to hop on over to Preux & Proper and indulge in the fantastic menu, you can find them at 840 S. Spring Street, Los Angeles, CA 90014. We visited on a Tuesday so missed out on their Thursday-Sunday special upstairs when a section turns into a hip-and-happening full raw bar, complete with freshly shucked oysters, jumbo shrimp, and crab claws. Guess we'll have to stop back in again sometime soon! "We strive to source our food and product from sustainable companies operated with love, care, and integrity. We're proudly sourcing from (and supporting): Rancho Gordo, Anson Mills, Johnson County Country Hams, Sadie Rose Baking Co., La Brea Bakery, Fresh Origins, Peads & Barnetts, Stone Valley Farm, Beeler's, Mary's Free Range Poultry, Vella Cheese Co., Berkeley Farms, Wuthrich, North Country Smokehouse, Strauss Free-Raised Grass Fed Beef, Santa Monica Seafood, Gioia Cheese Co., Giusto's, Chino Valley Ranchers, and Hudson Valley Foie Gras."